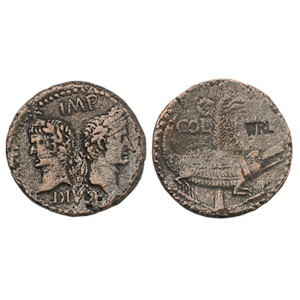 Obverse: The laureate heads of Augustus right and Agrippa left, back to back. Text above IMP, text below DIVI F.
History: This coin was minted circa 10-14 AD at the provincial city of Nemausus to celebrate the Augustan conquest of Egypt. It features the portrait of Augustus with his general (and heir) Agrippa. The reverse design is an obvious allusion to Egypt (crocodile) and its subjugation (chained to a palm tree).